This week marks Diversity Week at Michigan Ross, during which students will present 15 incredibly powerful and thoughtfully designed events that celebrate diversity, inclusion, and empowerment. We guarantee you won’t want to miss a single one! From training on what to do when you notice power imbalances in action to understanding how diversity and culture differences manifest themselves in marketing campaigns, plus uncovering the history of drag culture and learning how to make a Korean seafood pancake, the week’s schedule of activities are meant to educate, entertain, and honor the differences that makes the Michigan Ross community so strong. All events throughout the week were developed by leaders of Michigan Ross student organizations in partnership with the Ross Diversity, Equity, and Inclusion office. 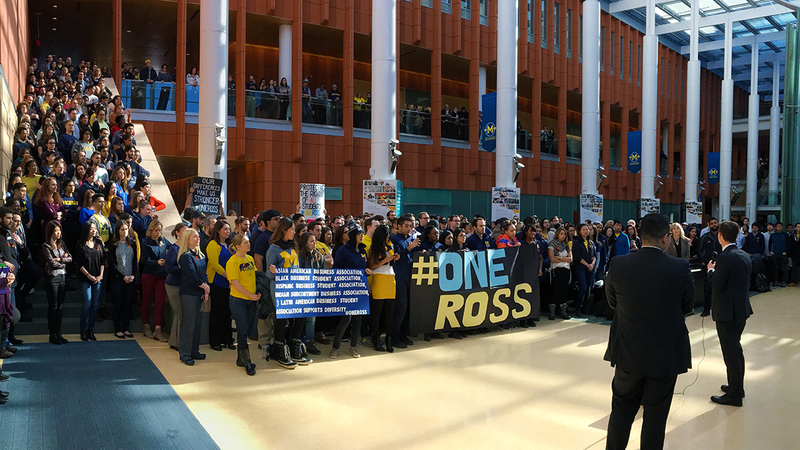 Learn more about diversity at Michigan Ross. Here’s a rundown of events happening during Diversity Week at Michigan Ross (Feb 11 - Feb 16). Has there ever been a time when you realized someone was being excluded, there’s language being said that’s hurtful, or you picked up on an unhealthy dynamic in the room and you didn’t know how to respond? You are not alone! Join us for a lunch and learn about bystander intervention and the ways that you can effectively interrupt a situation and leave feeling empowered to step in and step up when appropriate. Join MBW and MBW allies as we discuss the roles allies play at Ross and in the workplace. A panel of incredible students will be discussing their experiences in several different professional contexts, moderated by Val Adams from the Career Development Office. Come ready to engage with and discuss this important and relevant topic to kick off Diversity Week. A workshop provided by The Root Inc. to develop your skills to become an influencer in your community. The Root Inc. will guide students through a storytelling exercise where they will learn how to better influence organizations from within in order to impact its surrounding communities. Although we've seen increased awareness around diversity and inclusion in recent years, the retail and luxury goods industry still has a long way to go. Join Marcus Collins, Michigan Ross lecturer and SVP of Social Engagement at Doner, for an interactive lecture on the relationship between diversity and culture in retail and luxury campaigns and discussion on how some companies excel while others fall short. Presented by the Retail & Luxury Goods Club at Michigan Ross. Join AABA as several of their members share their Asian American experiences through storytelling. This event is open to all members of the Ross community. Leading up to MBgAy 2019, OFB will be hosting an evening to learn about the history of drag culture, its significance in the LGBTQ+ community, and address the difference between drag and transgender. The entire Ross community is encouraged to attend! Everyone comes to Michigan Ross with a unique past, a unique story, but so often that story is lost once core classes begin and recruiting kicks into high gear. Story Lab from the Sanger Leadership Center looks to change that by having Ross students tell their stories in an intimate, safe setting. You'll hear powerful stories from fellow students and learn more about what’s beneath the surface here at Ross. Ever wished trivia nights asked about places you've lived or been to? Diversity Week is your lucky week! The Emerging Markets Club is asking questions about the rest of the world and giving restaurant gift cards to the top three scoring teams. It's trivia, on a global scale. Ross student panelists from five different faith groups discuss the intersection between faith and business. They’ll discuss how faith identities impact career purpose and share special case studies from companies like Apple, Forever 21, and Elevation Burger. During this event, students will learn more about the culture, traditions, business landscape, and political climate of numerous countries in Latin America and Africa, and there will be a special spotlight on MAP locations that highlights travel tips, as well. This is a two-part event, with Friday’s session focusing on countries in Europe and Asia. In this workshop, presenters will review Whole Foods' expansion initiatives in low-income urban areas, including Detroit. Has Whole Foods been successful at feeding poor Americans? How has Whole Foods' corporate sustainability structure influenced the outcomes of the company's efforts, and can this structure be modified to generate more innovative solutions for Whole Foods? This half-day symposium will offer an opportunity to learn from inspiring entrepreneurial women through panel discussions, hands-on workshops, and networking. Topics will focus on leadership development, building a career path, and gender inclusion in the start-up space. The Zero Gap 50/50 lunch will include a conversation and guided dialogue about the gender gap, with equal numbers of men and women in attendance. Presented by the Michigan Business Women student club, these conversations are created with a belief that we need to bring together women and men to build a productive and solution-oriented conversation about closing the gender gap. It is a curated experience meant to build strong relationships and genuine camaraderie in a casual safe environment and is an important topic for business leaders everywhere. Students will learn more about the culture, traditions, business landscape and political climate of numerous countries in Europe and Asia, and there will be a special spotlight on MAP locations that highlights travel tips, as well. Students will learn more about Korean culture and how to make Korean Food, such as kimchi and seafood pancakes and japchae (stir-fried glass noodles & vegetables). Due to space constraints registration for this event is only open to Full-Time MBA students.